The HD160C is designed for professional use in harsh environments. The meter is unusually rugged and reliable in everyday heavy use applications.The meter is made using waterproof construction to prevent dirt, grime and moisture from entering the case and causing inaccurate readings or damaging shorts.Built of tough, fire-retardant thermoplastic resistant to grease and chemical spills, with all sensitive components shock-mounted for a drop resistance to at least eight feet. Model HD160C has an extended voltage measurement capability of 1500 V dc and 1000 V ac, unmatched by any other line of digital multimeters. 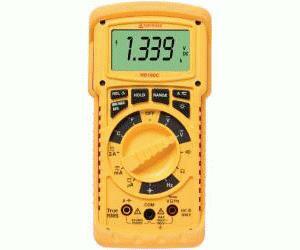 The extended voltage ranges can withstand transients up to 12 kV.